During the winter, our general training is on Mondays and Fridays in two different locations in central Toronto. On Monday evenings, we're at St. Michael's College School. These sessions are geared towards beginner archers. Intermediate and advanced archers thrown into the mix. We have some bows available for archers without their own equipment. On Friday evenings, we're at Armour Heights Community Centre. 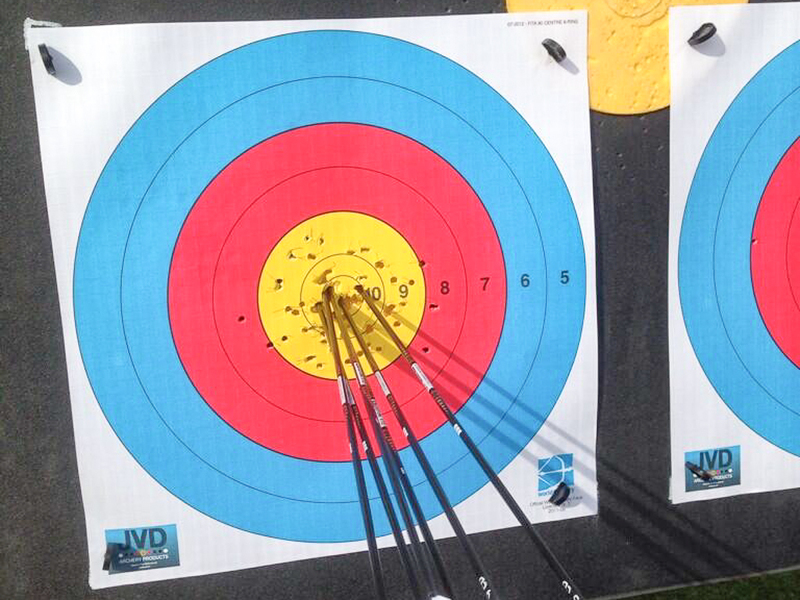 These sessions are focused on intermediate archers who have their own equipment and an interest in competition. Advanced archers are also training during this session. You must have your own equipment (but we're a bit flexible and can probably scrounge up something if you don't have equipment and can't make it to the Monday sessions). On other days and evenings and throughout the summer, we have access to a variety of shooting locations solely for coaching our High Performance national and international competitive athletes (the same athletes who provide some of the instruction and coaching on Mondays and Fridays). A reasonable 'rule-of-thumb' is that you're ready for this program when you're able to be competitive in your age group at the Canadian Target Archery Championships. There is a direct progression from our beginner instruction, through our intermediate coaching, and into this High Performance program following the Archery Canada Long Term Athlete Development Model. St. Mike's - Mondays starting October 15th through to, and including, Monday, December 3th. St. Mike's - Mondays starting January 7th through to, and including, Monday, March 25th. NO archery on February 18th (Family Day). Armour Heights - Fridays starting January 11th through to, and including, Friday, March 15th. St. Mike's - Mondays starting March 25th through to, and including, Monday, May 13th. Armour Heights - Fridays starting March 29th through to, and including, Friday May 10th. NO archery on April 19th (Good Friday). We do not offer scheduled instructional programs during the summer months. For each session one night/week is $130 and 2 nights/week is $180. Archers must have their own finger tab and arm guard. These can be purchased from us for $25 for the pair. All people shooting with the club must be members of the Ontario Association of Archers. This provides the athletes with insurance for when they are shooting (even though we say this, it really is a very safe sport). Membership information is here. The cost is $73 for adults and $58 for youth. Crispin Duenas's last end for the last every 1440 round. From the 2013 World Championships.